Dude. Duuuuuuude! Look at you. You said you weren’t going to get dressed up this year unless you could find an outfit that made you look as good as you feel. We’re glad to see you found this far out shirt and got your mojo going for tonight’s big party. It’s going to be sick. Only a chump would miss it, and you’re no chump! You’ve always known the 70s as the best era of all time, but let us give you a refresher course to inspire some serious fun tonight. The 70s was the era of disco, platform shoes, sequins, disco balls, the finger point, wild prints, plentiful polyester, the hustle…just LOOK at this shirt. Amazing. And people try to argue that another era was better than the age of disco? Dream on! To prepare for your event, you’ve binge watched all of your favorite 70s movies and have been ready to boogie ever since. Well, now’s the moment, so go get into this Dynamite Dude Disco Costume and we’ll catch you on the flip side! Voila! 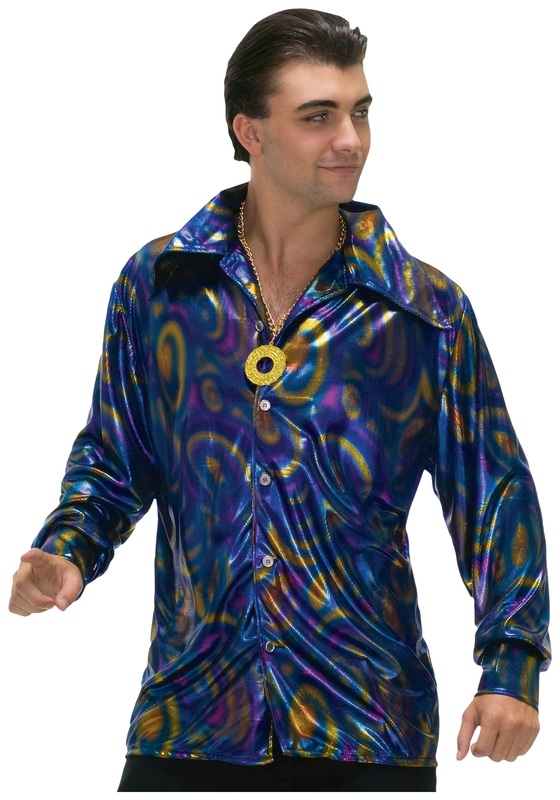 You look perfectly groovy in the blue and purple swirling, psychedelic print of this shimmering shirt. You’ve expertly tucked this polyester (what else?!) button-down into a pair of high-waisted white bell bottoms and added a pair of platforms for oomph. Wowza; you’re looking mighty fine. But c’mon cat, do us a solid add a little bling to top that top—slip on a necklace and tease out your hair to come alive as the disco king you are. Can you dig it?